We derive photometric, structural and dynamical evolution-relatedparameters of five as yet unstudied low-contrast open clusters locatedin the third quadrant using 2MASS data. The target clusters are Czernik31, Czernik 32, Haffner 9, Haffner 11 and Trumpler 13. We apply astatistical field-star decontamination procedure to infer on theintrinsic colour-magnitude diagram (CMD) morphology which is criticalfor such low-contrast objects. Consequently, it became possible toderive accurate reddening, age, distance from the Sun and Galactocentricdistance for the five clusters. In the structural andluminosity/mass-function analyses we apply a colour-magnitude filterwhich encompasses the cluster evolutionary CMD sequences and excludesstars with discrepant colours. Using this procedure we derive core andlimiting radii, mass function (MF) slope, total mass, mass density andrelaxation time. We derive ages in the range 140-1100 Myr,Galactocentric distances within 7.7-11.4 kpc, and total masses within360-2900 M_ȯ. Reflecting large-scale mass segregation, the MF slopein the core is significantly flatter than that in the halo of the fiveclusters. Although some of the present clusters are relatively youngerthan the Gyr-old clusters, they present evidence of advanced dynamicalevolution. This kind of study has become possible because of thephotometric uniformity and spatial coverage of 2MASS which allows aproper subtraction of the field-star contamination on the target CMDs.The present study indicates that low-contrast clusters can be studiedwith 2MASS, particularly after field-star subtraction, which isimportant since most of the unstudied open clusters belong to thisclass. We present a catalogue of astrophysical data for 520 Galactic openclusters. These are the clusters for which at least three most probablemembers (18 on average) could be identified in the ASCC-2.5, a catalogueof stars based on the Tycho-2 observations from the Hipparcos mission.We applied homogeneous methods and algorithms to determine angular sizesof cluster cores and coronae, heliocentric distances, mean propermotions, mean radial velocities, and ages. For the first time we derivedistances for 200 clusters, radial velocities for 94 clusters, and agesof 196 clusters. This homogeneous new parameter set is compared withearlier determinations, where we find, in particular, that the angularsizes were systematically underestimated in the literature. We derive photometric, structural and dynamical evolution-relatedparameters of 11 nearby open clusters with ages in the range 70 Myr to 7Gyr and masses in the range ≈400 M_ȯ to ≈5300 M_ȯ. Theclusters are homogeneously analysed by means of J, H and KS2MASS photometry, which provides spatial coverage wide enough toproperly take into account the contamination of the cluster field byGalaxy stars. Structural parameters such as core and limiting radii arederived from the background-subtracted radial density profiles.Luminosity and mass functions (MFs) are built for stars later than theturnoff and brighter than the 2MASS PSC 99.9% completeness limit. Thetotal mass locked up in stars in the core and the whole cluster, as wellas the corresponding mass densities, are calculated by taking intoaccount the observed stars (evolved and main sequence) and extrapolatingthe MFs down to the H-burning mass limit, 0.08 M_ȯ. We illustratethe methods by analysing for the first time in the near-infrared thepopulous open clusters NGC 2477 and NGC 2516. For NGC 2477 we derive anage of 1.1 ± 0.1 Gyr, distance from the Sun d_ȯ=1.2 ±0.1 kpc, core radius Rcore=1.4 ± 0.1 pc, limitingradius Rlim=11.6 ± 0.7 pc and total massmtot≈(5.3±1.6) × 103 M_ȯ.Large-scale mass segregation in NGC 2477 is reflected in the significantvariation of the MF slopes in different spatial regions of the cluster,and in the large number-density of giant stars in the core with respectto the cluster as a whole. For NGC 2516 we derive an age of 160 ±10 Myr, d_ȯ=0.44 ± 0.02 kpc, Rcore=0.6 ±0.1 pc, Rlim=6.2 ± 0.2 pc andmtot≈(1.3±0.2) × 103 M_ȯ.Mass-segregation in NGC 2516 shows up in the MFs. Six of the 11 clusterspresent a slope break in the MF occurring at essentially the same massas that found for the field stars in Kroupa's universal IMF. The MFbreak is not associated to cluster mass, at least in the clusters inthis paper. In two clusters the low-mass end of the MF occurs above theMF break. However, in three clusters the MF break does not occur, atleast for the mass range m≥q;0.7 M_ȯ. One possibility isdynamical evolution affecting the MF slope distribution. We also searchfor relations of structural and evolutionary parameters with age andGalactocentric distance. The main results for the present sample are:(i) cluster size correlates both with age and Galactocentric distance;(ii) because of size and mass scaling, core and limiting radii, and coreand overall mass correlate; (iii) massive (m≥q;1000 M_ȯ) andless-massive clusters follow separate correlation paths on the planecore radius and overall mass; (iv) MF slopes of massive clusters arerestricted to a narrow range, while those of the less-massive onesdistribute over a wider range. Core and overall MF flattening is relatedto the ratio (τ) of age to relaxation time. For large values ofτ the effects of large-scale mass segregation and low-mass starsevaporation can be observed in the MFs. In this sense, τ appears tocharacterize the evolutionary state of the clusters. We conclude thatappreciable slope flattenings in the overall MFs of the less-massiveclusters take ~6 times longer to occur than in the core, while in themassive clusters they take a time ~13 times longer. We investigatecluster parameters equivalent to those determining the fundamental planeof ellipticals. These parameters are: overall mass, projected massdensity and core radius. We conclude that in the present sample there isevidence of a fundamental plane. Larger samples are necessary to pindown this issue. We analyze 9 open clusters with ages in the range 70 Myr to 3.2 Gyrusing UCAC2 proper motion data and 2MASS photometry, which allows us toreach stellar masses down to ≈0.7 M_ȯ. We employ in this work anapproach in which the background proper motion contribution isstatistically subtracted in order to obtain the cluster's intrinsicproper motion distribution. For each cluster we consider the projectedvelocity distributions in the core and off-core regions separately. Inthe projected velocity distribution of all sample clusters we find awell-defined low-velocity peak, as well as an excess in the number ofstars at larger velocities. The low-velocity peak is accounted for bythe random motion of the single stars, while the high-velocity excesscan be attributed to the large velocity changes produced by asignificant fraction of unresolved binaries in a cluster. We derivekinematic parameters of the single-star distribution, in particular theprojected velocity dispersion. The relatively large velocity dispersionsderived in this work may reflect the non-virialized state of theclusters. Based on the relative number of high-velocity (binary) andsingle stars, we inferred for the sample clusters unresolved binaryfractions in the range 15%≤q;f_bin≤q;54%, for both core and off-coreregions. Stars with a projected velocity exceeding the maximum reachedby the single-star distribution are identified in 2MASS J×(J-H)colour magnitude diagrams. The asymmetry observed in the distribution ofthese stars around the main sequence is consistent with models ofmain-sequence widening resulting from unresolved binaries combined with2MASS photometric uncertainties. The present results suggest that caremust be taken when applying proper-motion filters to sort out members,especially binaries in a star cluster. This paper shows that propermotions turn out to be a useful tool for identifying high-velocity starsas unresolved binary cluster members, and as a consequence, map andquantify the binary component in colour magnitude diagrams. The mean proper motions of 167 Galactic open clusters withradial-velocity measurements are computed from the data of the Tycho-2catalog using kinematic and photometric cluster membership criteria. Theresulting catalog is compared to the results of other studies. The newproper motions are used to infer the Galactic rotation rate at the solarcircle, which is found to be ω0=+24.6±0.8 km s-1 kpc-1.Analysis of the dependence of the dispersion of ω0 estimates onheliocentric velocity showed that even the proper motions of clusterswith distances r>3 kpc contain enough useful information to be usedin kinematic studies demonstrating that the determination of propermotions is quite justified even for very distant clusters. We have compiled two new open cluster catalogs. In the first one, thereare 119 objects with ages, distances, and metallicities available, whilein the second one, 144 objects have both absolute proper motion andradial velocity data, of which 45 clusters also have metallicity dataavailable. Taking advantage of the large number of objects included inour sample, we present an iron radial gradient of about -0.063+/-0.008dex kpc-1 from the first sample, which is quite consistentwith the most recent determination of the oxygen gradient from nebulaeand young stars, about -0.07 dex kpc-1. By dividing clustersinto age groups, we show that the iron gradient was steeper in the past,which is consistent with the recent result from Galactic planetarynebulae data, and also consistent with inside-out galactic diskformation scenarios. Based on the cluster sample, we also discuss themetallicity distribution, cluster kinematics, and space distribution. Adisk age-metallicity relation could be implied by those properties,although we cannot give conclusive result from the age- metallicitydiagram based on the current sample. More observations are needed formetal-poor clusters. From the second catalog, we have calculated thevelocity components in cylindrical coordinates with respect to theGalactic standard of rest for 144 open clusters. The velocitydispersions of the older clusters are larger than those of youngclusters, but they are all much smaller than that of the Galactic thickdisk stars. New light elements for the long-period eclipsing variable CF Sct. The statistical-parallax method is applied for the first time to spacevelocities of 270 classical Cepheids with proper motions adopted fromHIPPARCOS (1997) and TRC (Hog et al. 1998) catalogs and distances basedon the period-luminosity relation by Berdnikov et al. (1996). Thedistance scale of short-period Cepheids (with periods less than 9 days)is shown to require an average correction of 15-20%, whereas statisticalparallaxes of Cepheids with periods > 9 days are found to agree wellwith photometric distances. It is shown that the luminosities ofshort-period Cepheids must have been underestimated partly due to thecontamination of this subsample by a substantial (20 to 40%) fraction offirst-overtone pulsators. The statistical-parallax technique is alsoapplied for the first time to 117 open clusters younger than 100 millionyears and with proper motions reduced to the HIPPARCOS reference system.It is concluded that a 0.12-0.15 mag increase of the distance scales ofopen clusters and Cepheids would be sufficient to reconcile thestatistical-parallax results inferred for these two types of objects.Such approach leads to an LMC distance modulus of less than 18.40 mag,which agrees, within the errors, with the short distance scale for RRLyrae variables and is at variance with the conclusions by Feast andCatchpole (1998) and Feast et al. (1998), who argue that the LMCdistance modulus should be increased to 18.70 mag. The distance scalebased on the Cepheid period-luminosity relation by Berdnikov and Efremov(1985) seems to be a good compromise. Extragalactic distances, whichrely on long-period Cepheids, seem to require no substantial correction.In addition to statistical parallaxes, kinematical parameters have beeninferred for the combined sample consisting of Cepheids andopen-clusters: solar-motion components (U0 ,V0,W0) = (9, 12, 7) km/s (+/- 1 km/s); velocity-ellipsoid axes(σU; σV; σW) = (15.0,10.3, 8.5) km/s (+/- 1 km/s); the angular velocity of rotation of thesubsystem, ω0 = 28.7 +/- 1 km/s/kpc, the Oort constantA = 17.4 +/- 1.5 km/s, and the second derivative of angular velocity,⋰ω0= 1.15 +/- 0.2 km/s/kpc3. Corridors in the regions of young open stellar clusters. Absolute proper motions of 181 young open clusters. Parameters of geometric models of 11 gas-star complexes (GSCs) wereobtained. We used information about GSC projections onto the celestialsphere and the Galactic plane and about GSC extension along the line ofsight. GSCs were represented as triaxial ellipsoids. To estimate thesemiminor axis of the GSC ellipsoidal model and GSC slope angle to theGalactic plane, we used data on spatial location of open stellarclusters (OSCs) entering GSCs. GSC slopes to the Galactic plane varybetween 2.5 and 20.5 deg. Their semiminor axes are between 11 and 164pc. GSC total masses are estimated from GSC tidal effect on OSCs thatare members of the corresponding GSCs. The effect manifests itself insmaller sizes of young OSCs as compared to their tidal sizes in theforce field of the Galaxy. We used studies of stability of an OSC movingin the joint force field of the Galaxy and spheroidal stationary GSC, aswell as studies of evolution of a virialized cluster located at thecenter of a nonstationary ellipsoidal GSC. Estimated total masses fordifferent GSCs lie between 0.65 x 10 exp 5 solar masses and 11.5 x 10exp 7 solar masses. Catalogue of blue stragglers in open clusters. An extensive survey of blue straggler candidates in galactic openclusters of both hemispheres is presented. The blue stragglers wereselected considering their positions in the cluster colour-magnitudediagrams.They were categorized according to the accuracy of thephotometric measurements and membership probabilities. An amount of 959blue straggler candidates in 390 open clusters of all ages wereidentified and classified. A set of basic data is given for everycluster and blue straggler. The information is arranged in the form of acatalogue. Blue stragglers are found in clusters of all ages. Thepercentage of clusters with blue stragglers generally grows with age andrichness of the clusters. The mean ratio of the number of bluestragglers to the number of cluster main sequence stars is approximatelyconstant up to a cluster age of about 10^8.6^ yr and rises for olderclusters. In general, the blue stragglers show a remarkable degree ofcentral concentration. Galactic open clusters provide an abundant sample of stellar aggregatesof various sizes, ages and metal abundances, apt to constitute atemplate for comparison with star systems in other galaxies. In thispaper we present and discuss a standard methodology to synthesize U,B,Vfluxes and colours, and apply it to a set of 138 open clusters. Resultsare compared with previous ones available in the literature. We wereable to calibrate a mass-luminosity relation by which we evaluated themass of ~400 open clusters, leading to a well defined present-day massfunction. The number-complete sample of galactic open clusters presentedin Battinelli & Capuzzo-Dolcetta (1991) is enlarged of a 15%. The radial velocities of 37 late-type stars (F5 - M5) in the fields offour open clusters were measured with a correlation spectrometer. Theirradial velocities are determined, and probable members of the clustersare selected. South African Astronomical Observatory. Research. Results are reported from a statistical analysis of observational dataon 100 open clusters within 2 kpc of the sun, selected from the catalogof Lynga (1987). The selection criteria and the completeness of thesample are discussed; the data are compiled in a table; and the analysisresults are presented in a series of graphs and characterized in detail.A cluster formation rate of 0.45 clusters/kpc Myr is found,significantly lower than the rates determined previously (using clusterswithin 1 kpc of the sun) and corresponding to a cluster star-formationefficiency of 0.0063. The low average cluster lifetime (about 10 Myr)suggests that clusters are formed as unstable systems. 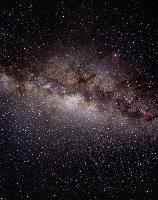 To obtain the most extensive set of characteristics of open clusters ofthe Galaxy by a uniform method, a computer program is designed toestimate interstellar reddening, distances and ages of clusters based onUBV-photometry data. Characteristics of 94 young clusters are estimated,and the distribution of clusters in the galactic plane is considered. Apronounced age gradient is found across the Sagittarius spiral arm.Several examples of triple and double clusters are considered. The physical properties of the 148 molecular clouds found in a CO surveyof regions around 34 young open clusters have been examined. Expressionsare given for the cloud size spectrum and the mass spectrum. Themass-radius relation implies that clouds of all size larger than a fewpc have about the same mean volume density. Power laws with slopes of0.6 and 3 describe, respectively, the relations of CO linewidth andcloud mass to cloud size. The clouds are distinctly nonspherical andappear to be randomly oriented with respect to the Galactic plane. Theobservations can be explained by a model for molecular clouds in whichclouds are ensembles of dense clumps of gas. Based on such a model, itis shown that molecular clouds are perturbed on a time scale shortcompared to the time required for them to reestablish virialequilibrium. Results are presented from a systematic search for CO emission fromregions around 34 young open clusters in the outer Galaxy. The clustershave well-determined distances ranging from about 1 to 5 kpc and agesnot greater than about 100 Myr. It was found that some moderately youngclusters have no associated CO emission. All the surveyed clustersyounger than about 5 Myr have associated with them at least onemolecular cloud more massive than 10,000 solar mass, while the molecularclouds associated with clusters older than about 10 Myr are not moremassive than a few thousands solar masses. It was also found thatmolecular clouds are receding from young clusters at a rate of about 10km/sec, and that they seem to be destroyed by their interaction with thestars. Sites of ongoing star formation were identified in a number ofclouds associated with young clusters. Catalog of open clusters and associated interstellar matter. On some complexes of galactic clusters. The distribution of open clusters in the Galaxy are considered, withspace coordinates including mass, absolute magnitude, integrated colorindex, diameter, metallicity, and age. It is shown that the majority ofclusters belong to several classes which have parameter values in asufficiently narrow range. The classes form a linear sequence by age andmonotonic sequence on a color-magnitude diagram. They are not isolated,but move into each other continuously. This suggests that the process ofcluster formation contains no significant gaps. The bifurcation of theage sequence of classes depending on the mass and diameter values isfound. This bifucation makes an evolutionary interpretation possible. The Galactic distribution of 361 open clusters is studied using acluster analysis method. It is shown that more than half of the clustersenter groups with characteristic dimensions of several hundred parsecs.To distinguish physical clusters from random condensations, criteriabased on age similarity, the color of the main-sequence blue end, andthe integrated color and radial velocity of the clusters are used. Theproximity of these values suggests a physical unity and common origin ofclusters in a group.